Old great players lists (esp. 1950s - 1970s) ? Discussion in 'The Beautiful Game' started by PuckVanHeel, Feb 15, 2017. Good news. I had the forethought to make notes on things of particular interest in past WS issues, so I managed to find the list I was talking about. It's from the Apr 61 issue of WS, and has two other poll results to go with the 1960 Ballon. Miroir were the rivals of France football. Their list is more over the place, typical French list. Jeffery actually does criticize the Ballon for having too much emphasis on forwards. He also makes note how a player that travels more, and thus is seen by more voters, has an advantage over a stay-at-home guy. Bonus: Kenneth Wolstenholme on Ballon 1960: "From an English viewpoint the results of the poll might shock some people". Haha, good ol' England. Gregoriak, msioux75 and PuckVanHeel repped this. This work was called "Football ABC" and the second page says expressely it was up to date until 1 March 1986. It got published May 1986. It was indeed made by a couple of VI journalists back then. I leave out the NET (Netherlands) players as well as almost all players who were back then active in the Eredivisie. Another criteria I apply is that there should be more than three sentences written about the player. This still means there's a slight emphasis on Belgian players, and "if it sounds exotic it sounds good", but that's inevitable. It was a book of 360 written pages. So I tried my best and this is the result. Next letter is K of course. So this should be the remainder then. It's not a perfect list, but it is informative. As said above, no NET players and no players with three full sentences, or less. The next few chapters focus on the spread of football to continental Europe, before reviewing the Olympic soccer tournaments. The 12-1 defeat of Sweden by England in 1908 could have been 30-1 without the goalie, who stopped an impressive 60% of the shots that came his way. Well, the French teams did even worse. It wasn't all bad, as the Swedes did well for 5 minutes. Quote from a magazine: "Normally, when playing against foreign teams, the English keeper has spent his time discussing 'daily gossip' with acquaintances, but on this occasion his peace was disturbed by the Swedes on several occasions". Next comes the most glorious moment in Finnish soccer history, the Olympic semi-final in 1912. It was considered a bit of an upset, as before the tournament the officials weren't sure whether they should send a team. A heartfelt letter by Finnish "football general" Kaarlo Soinio (author's brother and another international) and a successful tour in Russia conviced the committee it would be worth the investment. Finland beat Italy and Russia to reach the semis. Right-winger Filippov is mentioned as the best Russian player, too bad it doesn't say which of the two. The never-say-die 4-0 loss to Great Britain is mentioned as one of the finest performances of the NT (Hey, I'd take that result today!). In the third place match Finland lost 9-0 due to "exhaustion, injuries and other reasons, which shall be omitted on this occasion". I can guess. The final featured the expected England and Denmark. Pretty much every player is mentioned by name, with Woodward being the top guy for the British. Sophus "Krölleben" Nielsen gets the most mentions of the Danes, and Middleboe is named as the best centre-half in Europe. The Danish goal in the final was a legendary 35 meter giant-shot by Anton Olsen. Denmark and Holland played a English/Scottish short passing game, while the others were kick and rush (this was before Jimmy Hogan). Sweden played a mixture. Guerin Sportivo had 21-27 June 1995 (issue 25) these listed as the "grandi bomber". This was part 2; I think part 1 contained contemporary strikers but to be sure I ordered that too now. "The history of football is full of cannoniers able to score every year, caverns of goals. And also of less likely-to-played players to the opposite goalkeeper (so to speak), but they still left indelible traces of the heaviness of their prowess. One for everybody, Johan Cruijff: he has not been able to touch the numeric peaks of those who have been cited, but the goals of the Dutch "papero d'oro" [golden paper/gosling] have often decided the outcome of fundamental matches." Followed by a number of true center forwards and 'half' center forwards (John Charles, Sarosi etc.). Gregoriak and comme repped this. The 1920 Olympics are dismissed as a complete fiasco. Poorly arranged, officiated, and with a poor quality of soccer. The Nordic Countries had expected to perform well against war-worn nations, but the results were disappointing. Denmark arrogantly rested their best players, including their best striker Carl Hansen, in the preliminary against outsiders Spain. Zamora was "the most renowned football hero of the Olympics, and later the entire footballing world". This was the beginning of Denmark's great tradition of being eliminated by Spain. Norway's best player was Gunnar Andersen. The standard of European football exploded from 1921 on. Czechoslovakia, Austria, Switzerland and especially Hungary are mentioned as the strongest nations. Germany was expected to become the new England, but didn't rise higher than they did at the time due to too rigorous and discplined training methods. Hugo Meisl was a big Finland-fan, so in 1923 the NT went on a succesful tour in Central Europe, Beating Germany and losing narrowly to Austria and Hungary. "Would our current team be capable of such heroic feats with such good results? I have reason to doubt..." This book could have been written in 2017! Onto 1924, and the outsiders Uruguay, who ended up showing some "greatest football of all time". The Uruguayan forward line and Mazzali get a mention. Besides them, it was said Andrade could even dribble with his ears, and Nasazzi was the finest defender the world had seen until then. Orth also gets a mention as a major star. The 1928 tournament didn't reach the same standards as the previous one, partly due to the many withdrawals. The review gets a lot more interesting with the addition of all the "more or less sun-scorched" countries. The Uruguayan amateurs, who enjoyed "minister wages", were no "helpless baby partridges". In the game against Germany, they used "insidious and discreet minor impudences", which resulted in more uncouth German payback. The Egyptian referee ended up sending off Germany's best player Hans Kalb, whose "powerful and crushing playing style was not to the taste of the effetely fastidious Egyptian nobleman". Grand-shooter Richard Hofmann also gets a mention. Argentina walked their way to the final, where they played a boring, possibly fixed, draw. The rematch, though, was played for real! "Rarely has such a fireworks display of fully rounded footballing finesse and growth of creative power been seen". The Argentinians were superior tactically, but "significantly behind the Uruguayans in acrobatic playing skills". Paternoster, Monti, Tarasconi and Orsi are described as true world-class. 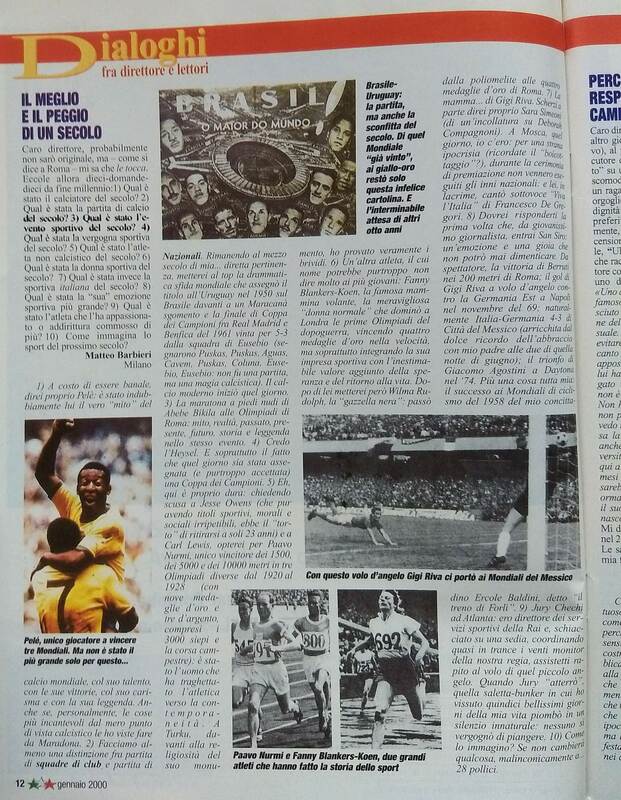 The number one issue of 1995 by Guerin Sportivo had an appendix called "Il grande libro degli stranieri - tutti i giocatore esteri del calcio italiano dal 1929 a oggi", which was primarily for individual statistics. In the main magazine "the emblematic Maradona stands for all the vibrancy, the colors, the shades of grey - and the subsequent collapse - of the 1980s." Although arguably a (typical) Italian viewpoint is discernible, these above players got highlighted in a cadre in the appendix. 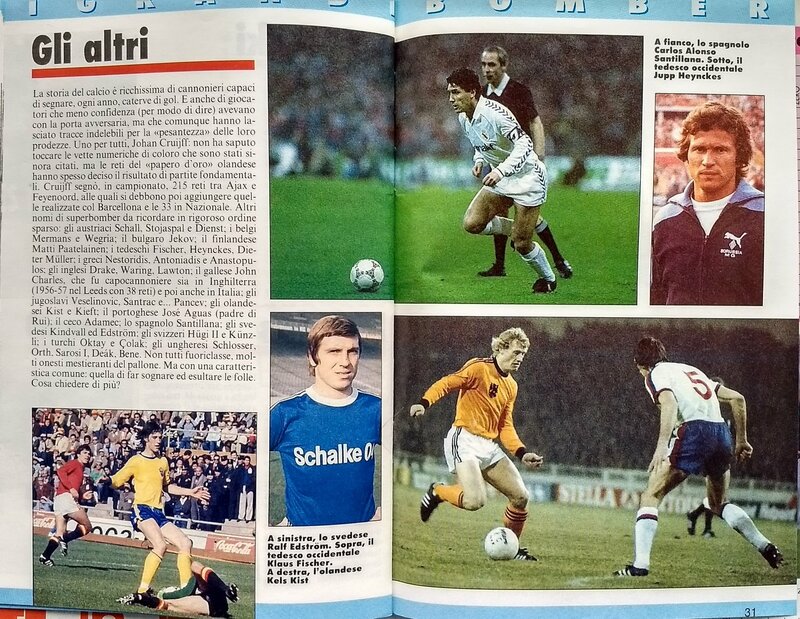 On the other hand, there were two extra pieces: Platini was designated as "perhaps the best and most consistent" creative foreigner in "Italian football" since the borders opened in 1980; and then there was another peculiar piece revolving around early import Krol ("an all-around defensive eye opener" and "together with Kohler some years later one of the very few foreign defenders to be actually the best in their job") and in the same piece the "not to be underestimated and necessary" role and tactical influence the "opinionated" Gullit and Van Basten had in establishing the Italian league as the foremost force in European football. Gullit ("one of the most charismatic figures of recent times") is praised for his time in Sampdoria, his completeness, as well as the idea he was the first black European to be "arguably" best in the world and the first black European to lift a major international trophy as captain. "Milan is still missing the often broken and battered 'swan of Utrecht' to this very day." I found this in a library, but in the meantime I try to search for something better and I think I'll receive something from 1987 later (on the first 60 years of the league with foreigners, by GS). Part 1 were indeed contemporary strikers. Then further highlighted honorable mentions for: Abel Balbo (Argentina and AS Roma - b. 1966), Mario Basler (Germany and Werder Bremen - b. 1968), Bentinho (Brazil and Sao Paolo - b. 1971), Stan Collymore (England and Nottingham Forest - 1971), Andy Cole (England and Manchester United - b. 1971), Martin Dahlin (Sweden and Borussia MG - b. 1968), Giles de Bilde (Belgium and Eendracht Aalst - b. 1971), Jose Oscar Flores (Argentina and Velez Sarsfield - b. 1971), Robbie Fowler (England and Liverpool - b. 1975), Marco Grassi (Switzerland and Rennes - b. 1968), Patrick Kluivert (Netherlands and Ajax - b. 1976), Meho Kodro (Bosnia and Real Sociedad - b. 1967), Darko Kovacevic (Yugoslavia and Red Star Belgrade - b. 1973). Needless to say that the likes of Savicevic just weren't seen as 'bomber'. It is similar to the 1989 Super Ballon d'Or by France Football (although the SBdO was also decided by journalists, the readers and the television viewers), the 1999 player of the century by France Football, the 2004 Champions Magazine poll (maybe in terms of method the best attempt of the lot), the 50 years Ballon d'Or survey (2005) and 50 years World Soccer survey (2010) in the sense that peers were asked, instead of the public or journalists. Managers, chairmen as Ken Bates and officials like Blatter and Havelange voted as well. They rightly mock the selection of Micky Droy by Neil Ruddock. Pelé finishes first, surprise, despite one third not having him in their top five. 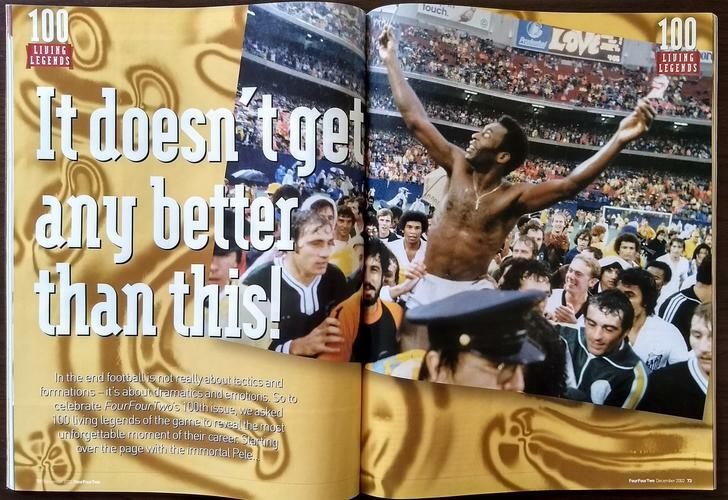 About some shortened careers (except George Best, effectively done at 27) like MvB they remark "But for a spate of nagging injuries, the songs of praise for Van Basten [by peers] would doubtless have been greater." The next one to receive a similar comment is Gascoigne. December 2002 was the 100th issue of Four Four Two. 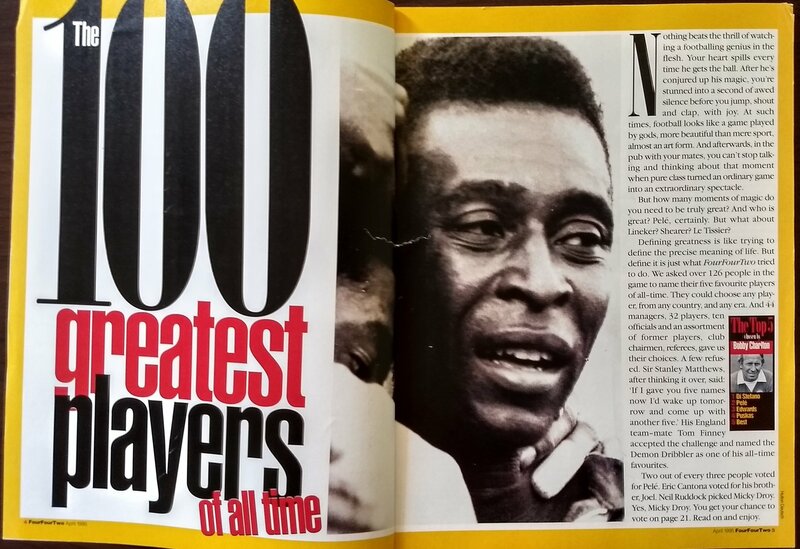 Although it is doubtful they placed them in order (besides, the likes of Rush, Netzer and Rummenigge receiving more 'speaking time' as Pelé and as much as Maradona) it is nevertheless interesting to compare who is included in both. Beckham is #2 despite having only 1/4th or 1/5th of the space of Rush for instance, and about 1/3rd or 1/4th of Maradona. The shortest answers are given by Cruijff, Gullit, Dalglish and Romario while defining Premiership stars Cantona (#92 in 1995) and Bergkamp declined to be interviewed. The foreword by the editor says "we asked 100 living legends in the game" - they're all numbered but I may hope this was not in order. Nevertheless with the earlier 1995 list in mind (albeit by peers, and not only 'living') it becomes somewhat more informative. This is not too old - maybe therefore not previously posted - but this was the prominent L'Equipe publication in 1999. It is also published in the book "100 rois pour un siècle". The good thing is that they were aware of the breakdown per birth period, breakdown by nation, how many midfielders and defenders were included (10 defenders), and that for example Ballon d'Or laureates Belanov and Baggio (as well as Sammer) are left out of their top 100. They are aware of what they did. Of course also clearly a French perspective - also with respect to someone as Weah, Francescoli - but nevertheless interesting to share and it isn't made up by one or two persons (at times showing the discussion, esp. with respect to world cup wonders). Despite some odd names thrown in there, some of the things behind the numerical order are quite good and well done. I do find Baggio being thrown out of this a mistake. If Baggio doesn't make it then Romario shouldn't either. I always felt Romario was crowned the world's best by default to some extent. It was more Baggio's crown to lose. Romario didn't exactly take the mantle away from Baggio, it was Baggio who relinquished it in the final of USA '94. The interesting part is that this time Zico and Rummenigge are quite close and in accordance with how it was back in their day. Pedernera, Sivori, Kempes and Batistuta are listed but no Moreno or Antonio Sastre. This are their profiles, just for interest. I sort of like that they presented them in alphabetical order but ranked them too somehow! Nice that they made profiles in a book rather than only a list too. Received this a 1.5 months ago but hadn't the time back then and then forgot it. In October 2010 Guerin Sportivo had a special issue about the first 30 years the borders of the Serie A had opened. It is called "Trent'anni di frontiere riaperte - I Grandi Stranieri". The issue has no adverts and is 160 pages long (on ~A4 format). They aren't ranked, but qualitative and quantitative arguments are given about their impact. Those are not ranked either. Apart from possibly Zanetti (this was published after the Inter treble, but before the loss in the Club World Cup and such), this selection is actually not too bad. They mention and specify Nedved's consistency. The title of Zidane's piece is "the timid champion", which is meant as multi-faceted. Contexts are given too, some interesting sub-cadres, and overall it is not too bad and even contemplative at times (or: 'at many occasions'). comme and PDG1978 repped this. Nice find. Perhaps Platini missing the 'podium' so to speak the most interesting/surprising(?) call? How many players are mentioned in total (in the same way as Elkjaer, Gullit...)? Nice find. Perhaps Platini missing the 'podium' so to speak the most interesting/surprising(?) call? Yes I think so too. In the 15 years review (from 1995) they were very positive on Platini. See post #106. There is of course a distinction between "best" and "most impact" although I'm sure Platini deserves to be considered for impact too. The 2010 pieces really revolve the most around the impact/influence. I can post scans if you like. How many players are mentioned in total (in the same way as Elkjaer, Gullit...)? (Hope you forgive/look past the dubious reference to Cruyff regarding the 1994 match; to be honest I just couldn't overlook Savicevic's omission from that list of 50 lol so wanted to find something to post regarding him, but I assume place 23 is indeed given to Stankovic and it's not a typo!). Another name I'm surprised not to see, perhaps moreso than Savicevic, in that top 50 foreign Serie A players list, is Juan Sebastian Veron. Savicevic's case might be more prime form based (and for me also prime season/s overall I'd feel - 94/95 and to an extent 95/96) and European competition performances are not considered so that feasibly reduces his case (but to be clear, and I saw a lot of Serie A in his time, I'd easily include him even if trying to make the list more about consistency/longevity). Veron though, for a foreign player, had several good to very good seasons surely. Yes I'd say so too. For one of the 50 names or the 'honorable mention' (like Ibrahimovic etc.) type of thing he would be a proper fit. Personally I'm more convinced about his capabilities than Riquelme (in particular when doing it reliably for and against the best teams) - but that conversation doesn't fit here. In skill he might belong there although on e.g. Youtube one can find several wonderful passes by the likes of Prohaska, Nedved and Seedorf too. Maybe his 'flop' spell at Manchester United and - more so - Chelsea when he was 26 to 29 years old did not help. His very best season is 1999-00 I think. His grade is the best, scored more goals than in other years, had more appearances than in other years and had double digits assists in the league (in other seasons not more than 5 or 6). A good candidate for second best Serie A season is actually 2004-05, at a real top team. There he had 3 (or 4) assists and 3 goals across all 39 games, but that was not his main job and strength. His job was to run the show and run the team. In that department he belonged among the world elite, and he could do it against the better teams too. Quite a bit has been said and written about the differences between Serie A and Premier League, but I also wonder whether people hadn't a wrong picture of him. They thought he would make a wonder assist every other game (which almost no player at the time was able to do). But the 1999-00 season aside, and some campaigns here and there (the 2001-02 and 2002-03 Champions League seasons; the 1998 World Cup), he wasn't a consistent assist machine. Not for the league at least. He was there, as said, to run the show if lined up with a good shuttler (Stankovic at Inter) and/or a good defensive midfielder. But for running midfield Manchester United had already Roy Keane and at Chelsea (in a different way) Frank Lampard. Playing Veron higher up on the pitch did not work well either, and negated what he could do best. I'd say Veron had about four very good (or better) Serie A seasons, with 1999-00 as his zenith. That very well might be more than adequate to merit a place in the top 50 or the broader circle. Yeah, I'd say at Sampdoria (perhaps 96/97 is in the mix among best seasons? I guess his Parma one is boosted a bit by games outside Serie A which might not be considered?) he was playing in a manner/role closer to a Vieira than a Zidane probably. I suppose Man Utd were never looking to replace Keane, or drop Scholes. Ferguson wanted to develop a team with a 5 man midfield which he thought would help to do well in Europe I think didn't he? Despite mixed form, Veron was making some nice passes and producing some assists I recall, early-ish in his Man Utd career. I think 1998-99 and 2004-05 are the main candidates for his 2nd best season (1999-00 being his best) - overall and in Serie A. The 1998 World Cup and (to a lesser degree) the preceding 1997-98 season made that he was picked up by ambitious Parma (nicknamed 'FC Pharma' in Holland, LOL). Sampdoria finished 6th and 9th when he played there, and logically he was under the radar. His ratings are solid but not as good as team mates Mihajlovic, Montella, Mancini (in 1996-97) and Bohossian and Montella (in 1997-98). The 1998 World Cup to November 2000 was his zenith I'd say (rest of 2000-01 troubled by injuries), while playing for/against competitive teams. His Sampdoria seasons might be over-appreciated in memory, the 2004-05 season unfairly overlooked I'd say. 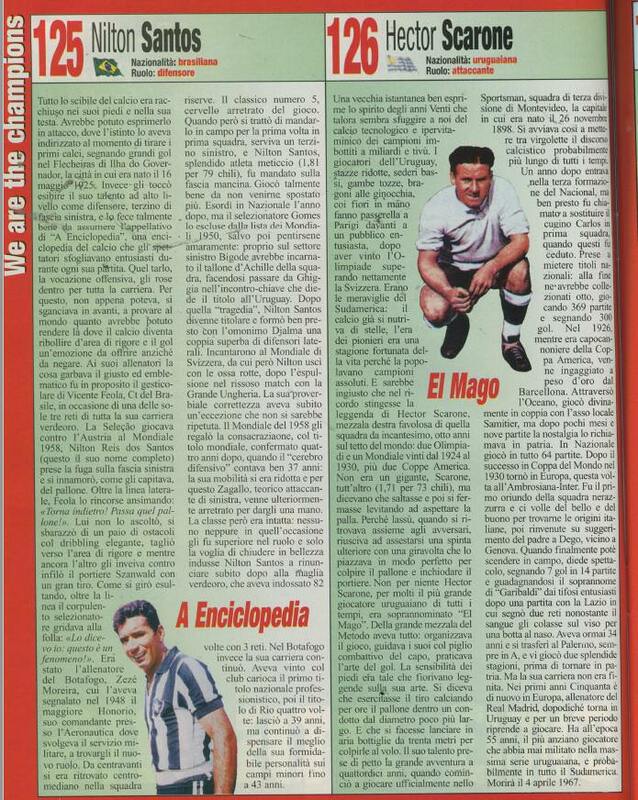 'Calcio 2000' had January 2000 also a list with 150 players, which are not ranked. It leans heavily on players who once played in Italy, or were a major success there. Thus no Michael Laudrup in there, while others get in. It has some inclusions born in the 19th century. The two youngest to get in were Ronaldo (b. 1976) and Maldini (b. 1968). In terms of Ballon d'Or winners Kevin Keegan was the main omission, and as double winner apparently not good enough for the 150 born between 1890 and 1968. The next in line to get in - or added - were maybe/probably Batistuta and Bergkamp (both born 1969), with both getting high praise by the magazine. Either way, I'll post those 150 later. I'm busy with ordering them by birthyear and also signalling with an asterisk whether they played in Italy (= many of them). Although those 150 are not ranked (for a reason), the chief editor had his own answer on page 5. I think it is especially interesting for players who were active in Italy, so I marked those with an asterisk. Some of the issues of this magazine can be found on soccernostalgia.blogspot too. annoyedbyneedoflogin, comme and PDG1978 repped this. To give an idea, here is an example of a profile. All profiles are about equally long. All about half a page. Excellent info by Gregoriak, about best players until early 1940s.